Democratic bills to legalize the recreational use of marijuana have gone nowhere at the Arizona State Legislature, but advocates say their main strategy has always involved the ballot box. The Marijuana Policy Project, the Washington, D.C.-based group behind the effort that legalized medical marijuana in Arizona, plans to begin collecting signatures in late April to get the issue before voters in 2016. While an effort to make the 2014 ballot foundered, Carlos Alfaro, Arizona political co-director for the Marijuana Policy Project, said there is a larger coalition for legalization this time around, in part because Washington and Colorado have done so. “Law enforcement, parents, students at Arizona State and beyond – all the other universities in the state are going to be crucial to this,” he said. Rep. Mark Cardenas, D-Phoenix, authored bills to decriminalize marijuana possession and to legalize and tax recreational marijuana for adults age 21 and older. Both failed to even see a committee. With conservatives in control of the Legislature, Alfaro said legalization would have to be done through voters. In 2010, when voters passed Proposition 203 to legalize marijuana use for medical reasons, Alfaro’s group led the campaign. He said public opinion is heading in the right direction this time around. A poll by the Morrison Institute for Public Policy at Arizona State University suggested that 45 percent of Arizonans support making recreational marijuana legal for those 18 and older. 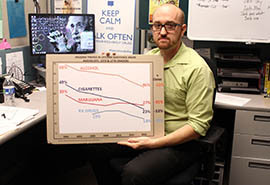 Mason Tvert, communications director for the Marijuana Policy Project, said it’s common-sense to legalize marijuana. On March 17, the marijuana advocacy group Safer Arizona sponsored a march through downtown Phoenix promoting legalization. But Justin McBride, program manager for drugfreeazkids.org, said legalizing recreational use of marijuana would lead to more children using the drug. A 2012 survey sponsored by the Arizona Criminal Justice Commission found that 11.8 percent of students said they obtained marijuana from someone with a medical marijuana card. “Just because there are other substances that are harmful to one’s health doesn’t mean we need to introduce another that is legal to obtain,” McBride said. Democratic bills to legalize the recreational use of marijuana have gone nowhere, but supporters say their key strategy involves the ballot box. The Marijuana Policy Project is organizing to put the issue to voters in 2016. 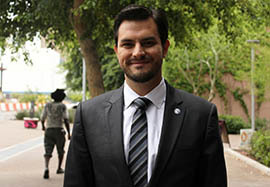 Carlos Alfaro, Arizona political co-director for the Marijuana Policy Project, said a broad coalition is pushing to put recreational use of marijuana on the Arizona ballot in 2016. Justin McBride, program manager at DrugFreeAZKids.org, shows a chart showing substance abuse rates among high school students in Arizona. He says legalizing recreational use of marijuana would lead to more children using the drug.